I was talking with Pexx about The Tavern's Discord Server and we are both really impressed with the growth its seen in the past few weeks, not just with new members but third-party publishers and content creators. How about third-party publishers? We now have ten with their own channels: Autarch, Barrel Rider Games, Bat in the Attic, Battlegrounds Games, Gaming Ballistic, Hack n Slash, Infinibadger Press, JB Publishing, Kort'thalis Publishing, Saga RPG, and Silver Bulette. Looking for "content creators?" Gothridge Manor, Mystara, Middle Kingdoms, Megadungeon Games, Tabletop Bellhop, and Uncle Matt's RPG Studio. Phew! Want to help us grow more? Invite your gaming buddies. Need a link to send them? Know an old-school publisher, podcaster, blogger, Youtuber or the like that isn't on the above lists? We'd love to add them. 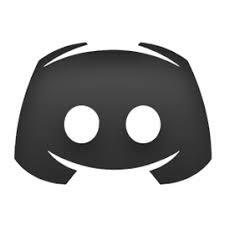 Drop me a PM on Discord with their contact info and we'll try and make it happen. Are YOU an old-school publisher, podcaster, blogger, Youtuber or the like that isn't on one of the above lists? What are you waiting for? Email me at tenkarsDOTtavern at that gmail thing and we'll set it all up for you. Want to take it a step further? Download the Discord Client for Windows, OSX, Linux, iOS or Android. 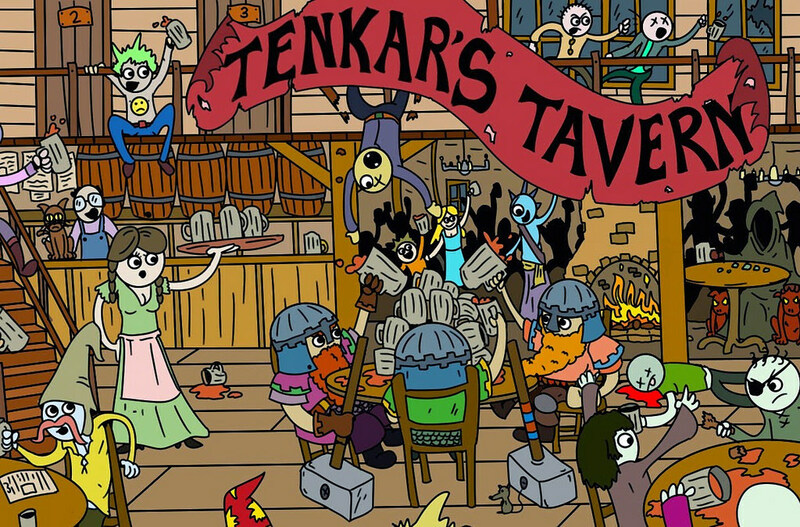 Here's an easy link: tenkars-tavern.games/DiscordApp Just download and install. It can run in the background. It gives you easy access to The Tavern's Community on Discord. Your community. I always have Discord open on my second monitor when I'm working, browsing, watching YouTube or Netflix and sitting at my desk. Because of you. And maybe even that other guy but I can't be sure. A gaming related Calendar on Kickstarter - last I backed was the Baby Bestiary. Actually, that's the only one I've ever backed. Looks like I'm backing another. 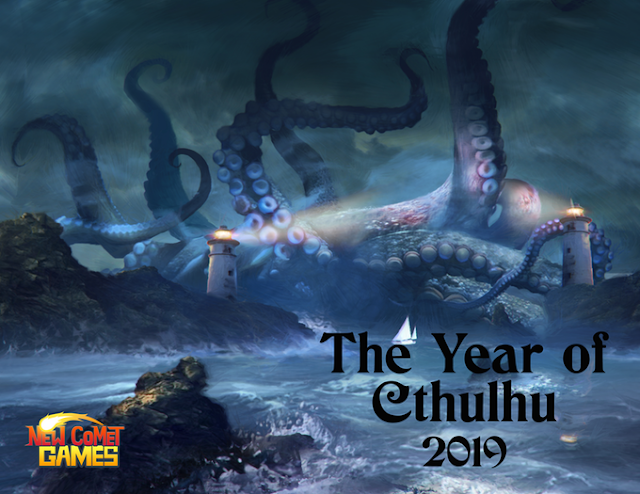 The Year of Chtulhu - 2019 Calendar Kickstarter looks damn sharp. 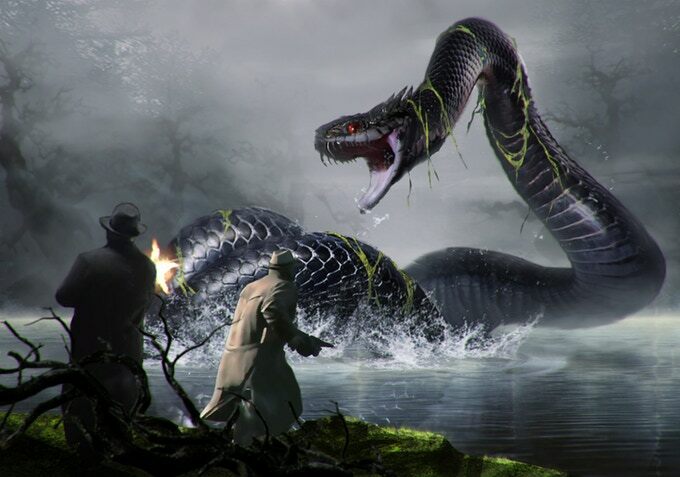 I love the art. really, is there another reason to back a Kickstarter like this? Sweet spot to back at? 12 bucks - and that includes shipping! The Year of Cthulhu is a Calendar for 2019 featuring the beautiful art work of Evgeni Maloshenkov and brought to you by New Comet Games. 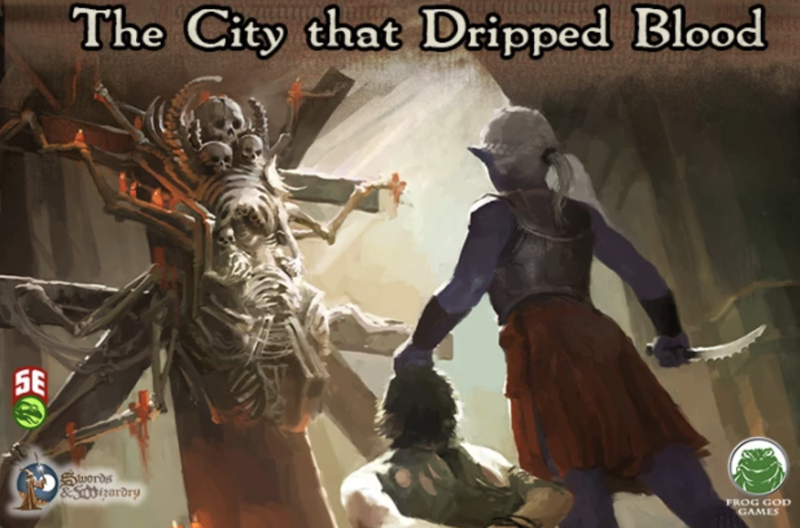 The Tavern Chat Podcast - Episode 85 - $500 Waterdeep Platinum Edition for 5e - WTF? 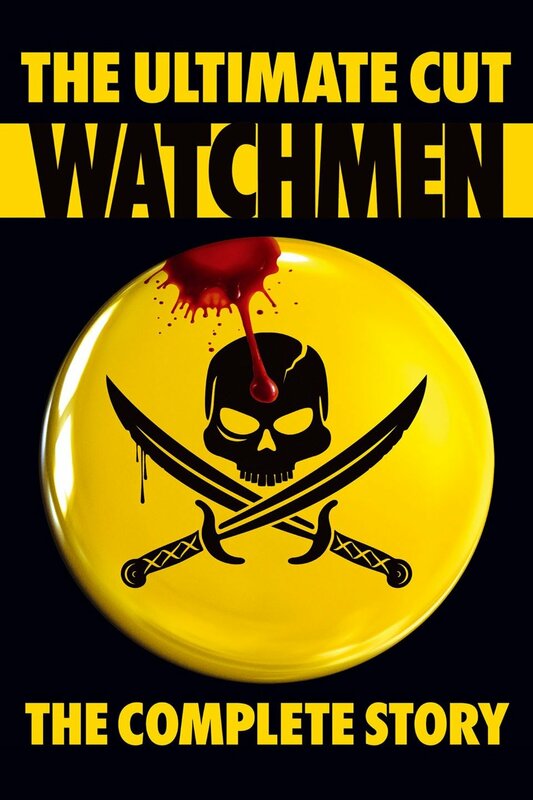 I know we are a hobby that enjoys collectible, limited editions, but 500 bucks for an adventure that will be available in hardcover for 50 - or less than 40 shipped on Amazon. WotC has licensed a $500 "Platinum Edition" of its upcoming Waterdeep: Dragon Heist adventure, the same adventure that will release 2 months earlier in hardcover for 40 bucks - shipped - on Amazon. There is an affiliate link above. Long live the rise of the affiliate link. Hail Cobra! 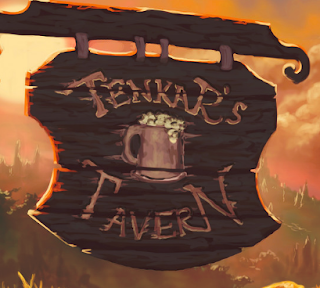 Reminder - Tavern Chat - 9 PM Eastern - Post Gen Con Yapup? Yep, its a Wednesday Night, and that means Tavern Chat at 9 PM Eastern. Where all the cool kids and grumpy grogs hang out. Tavern Chat is mostly a voice chat but you don't need a mike to listen and there is an accompanying text channel. The experience has been, at times, likened to a live podcast that is unscripted with random participants and some more or less regular hosts. Ask anyone that has played in a game session with me, I love to use different voices. I feel it makes NPCs more memorable and furthers your players' ability to suspend disbelief. Today I talk about using voices - accents and catchphrases, to make your NPCs come to life. I also talk about how the Tenkar's Tavern Discord Server has channels for third-party publishers and content creators. 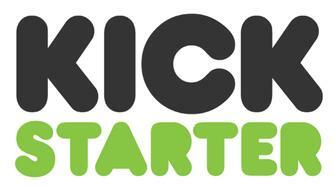 Yep, Tuesdays are Kickstarter Day on The Tavern Chat Podcast, and we have a lineup that you should find interesting. Alas, no all-weather dice tubes this time around. I'm excited to alert our fans that our adventure module The Sinister Stone of Sakkara is being released for Fifth Edition. We're currently running a small IndieGoGo campaign to cover the costs of layout and printing so that we can offer an offset printed version of the book. 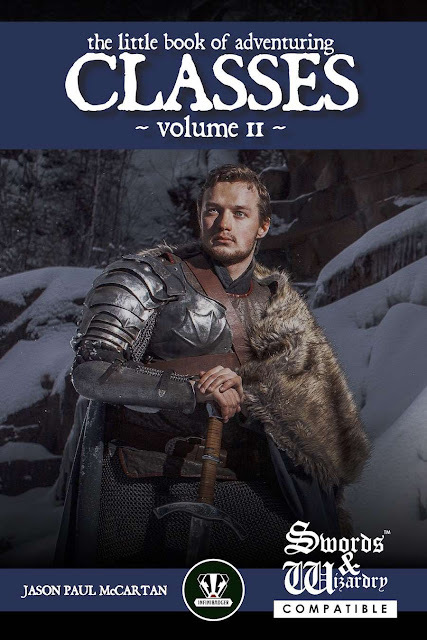 This is Autarch's ninth crowdfunding project, but it's our first Fifth Edition project. All of our prior material has been for our proprietary Adventurer Conqueror King System. 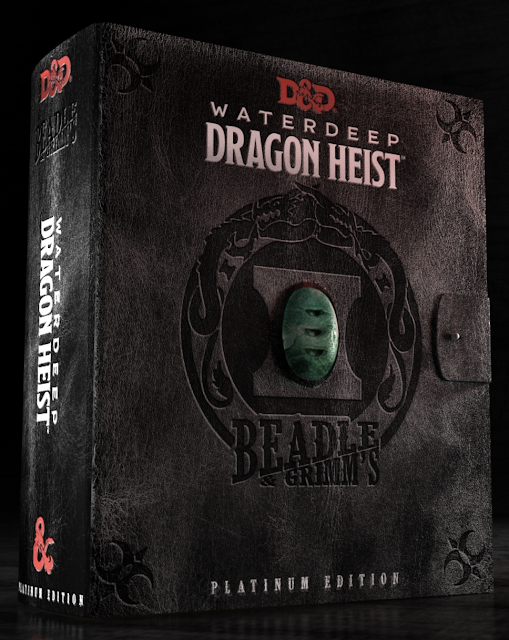 We're very excited to begin to adapt our material for the world's most popular RPG. The adventure scenario is approximately 50,000 words. That's 10,000 words more than the adventure's old school version. The Sinister Stone of Sakkara has been re-written from the ground up to follow the XP, Challenge Rating, and Treasure guidelines for 5E. The adventure is set in our Auran Empire campaign world, a swords & sorcery setting inspired by the Late Roman Empire. 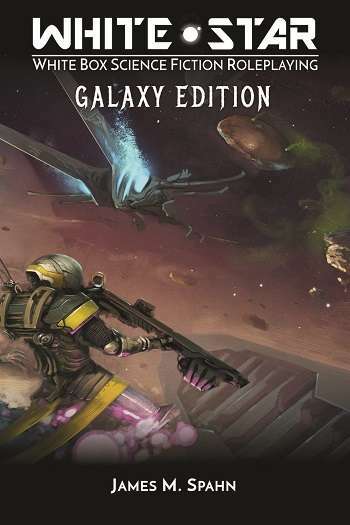 For the first time, we offer Fifth Edition stats for many monsters of the Auran Empire, including the Abominable Young Dragon, Abomination, Birthing Tree, Brigand, Possessed Giant Spider, and Zaharan Ruinguard, plus 5E stats for Imperial Cataphracts, Legionaries, Legates, and more. A starting base including a villa, headquarters, hospital, chapterhouse, infantry barracks, cavalry barracks, bathhouse, traveler's inn, and forum, all mapped and keyed. A dungeon with two levels, the first with 75 rooms and the second with 39 rooms, mapped and keyed, along with two custom random encounter tables. If you play 5E, I hope you'll check it out. 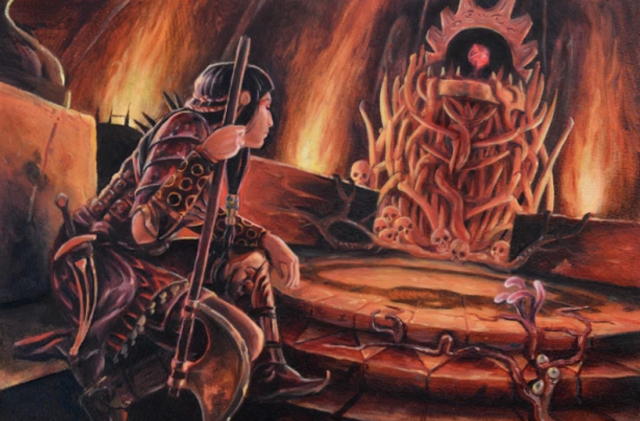 It's a great adaptation that brings the fortress and dungeon to life with 5E mechanics. If you know friends who are into Fifth Edition and looking for new content with an old-school feel, please have them take a look. Thank you, as always, for being a supporter of our work. The Tavern Chat Podcast - Episode 82 - How Can a Top 100 List Only Go to 85? Feedspot! Damn it. I had planned to play with funny voices today. Distractions are the bane of my podcasting. Squirrel! Before the launch of The Fantasy Trip Kickstarter, I had an email exchange with Steve Jackson (of Steve Jackson Games, not the other one ;) regarding The Fantasy Trip. Steve answered some questions and I suspect some of the answers may lead to questions from my readers. 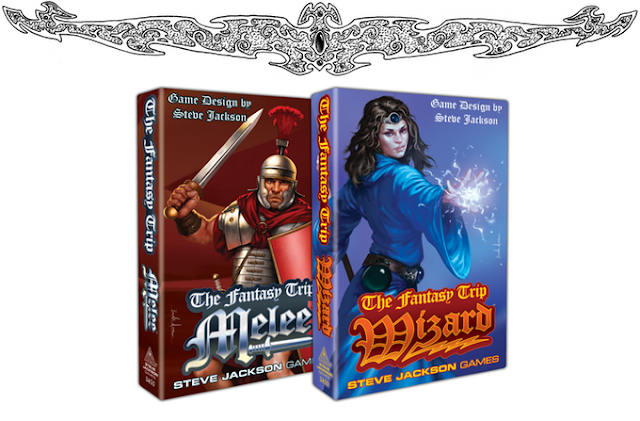 If you do have some questions, leave them in the comments section and I'll forward them to Steve Jackson Games. Tenkar: Here is the initial round of The Fantasy Trip questions. I expect some answers to generate further questions. There is no specific reason for the order of the questions. I must confess to not owning a copy of the original rules. Not for lack of interest, simply lack of desire to be shaken down on Ebay. Tenkar: 1 - Steve, what was your inspiration for The Fantasy Trip? What were you trying to accomplish with the rules when you wrote them? Steve: For the original Melee, the inspiration was OD&D and I wanted to create a better combat system, for “suits me better” values of better. I like hexes. For the later material, the inspiration was all the fun we were having playing Melee, and the goal was to see if I could create a coherent but simpler rules system. Tenkar: 2 - Are you surprised by the amount of nostalgia and love there is for The Fantasy Trip? Steve: In a word, yes! Tenkar: 3 - I believe GURPS is an evolution of The Fantasy Trip, much like AD&D was of OD&D, perhaps with more divergence in the case of TFT / GURPS. With the new printing of TFT, will we get to see a “what if" version of The Fantasy Trip if it had been allowed evolve on its own? Steve: It won’t be the same as 40 years of natural evolution,, but yes, it will at least be a lot like it would have been if I’d had another few months and Metagaming’s print budget had been greater, back in the day. Tenkar: 4 - Rob Conley raised a question in The Tavern’s weekly voice chat session - Will there be something similar to OneBookShelf's Community Content Program for The Fantasy Trip, so that third-party publishers could publish content for TFT and share the profits with SJg? Tenkar: 5 - What kind of initial support can be expected after the core rules are released? Adventures, campaign setting, etc? Steve: Yes and yes. We’re working on a neat GM tool, and an introductory one-character solo. Tenkar: 6 - I see $60 is going to be the "I want it all" cost for TFT on KS. What are the plans for distribution aside from KS? Steve: Not fully formed. Melee and Wizard will be in stores. If the whole Legacy box is in stores, it will be considerably more than $60. Tenkar: 7 - Related in part to Question 4, are there any third party publishers that have asked or have lined up to support TFT (understood if this is confidential - yes or no may suffice)? Tenkar: 8 - With Melee and Wizard being published at the same time this time around, has that enabled you to ensure both books work seamlessly with each other? Steve: I have certainly given it the old college try. 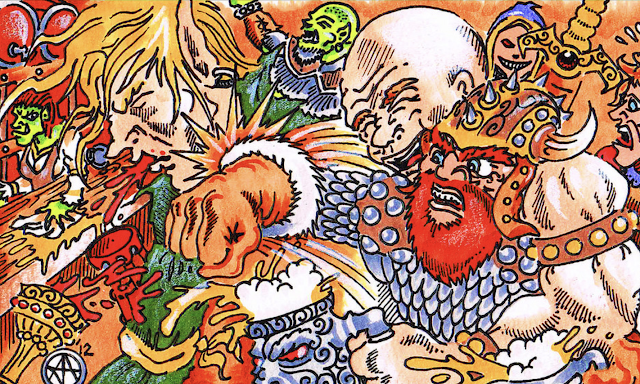 Tenkar: 9 - Will Advanced Melee and Advanced Wizard be a part of the initial core books, are they something for later or is it something that hasn’t been considered yet. Tenkar: 10 - Which, if any, of the original supplements that you no have the rights to will be reissued? Steve: All of them, eventually. Everything but the Death Tests is in the basic set, and the DTs are stretch goals that I really hope will be hit. If not, they will be part of the first supplement package. Feel free to ask follow-ups. Actually, the Rifts Bundle of Holding is TWO different bundles. Personally, I think the Wolrd Books offer more, especially if you are going to yoke it for setting material over system. 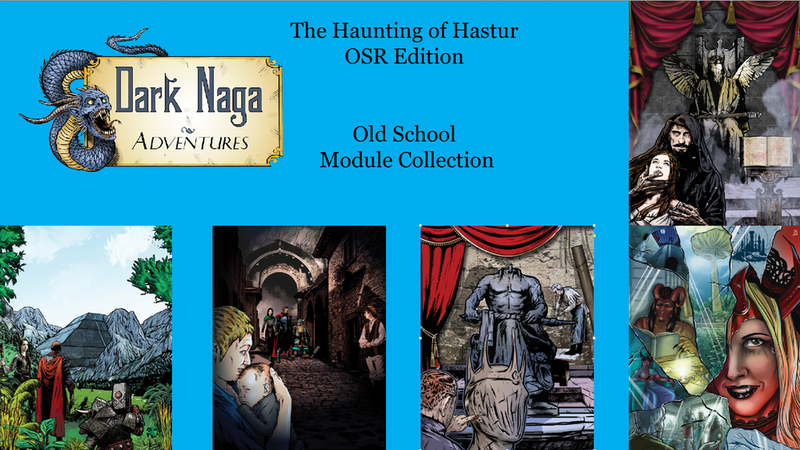 The Haunting of Hastur series of modules were originally a 5e release. The Dark Naga - OSR Haunting of Hastur Modules Kickstarter brings them to the OSR. Dark Naga has a history of doing some solid RPG releases, regardless of system, and I expect nothing less from their latest release. There is a little bit of editing to be done. See below on changes to DNH1 - The Lost Temple of Forgotten Evil. Beyond that, as soon as the project funds, I will order the proofs, and as soon as they are verified, the print copies will be ordered. This will be a fast cycle project. So fast, that there won't be any add-ons available via Backerkit. I expect to place the print order a few days after the funds post to my account.